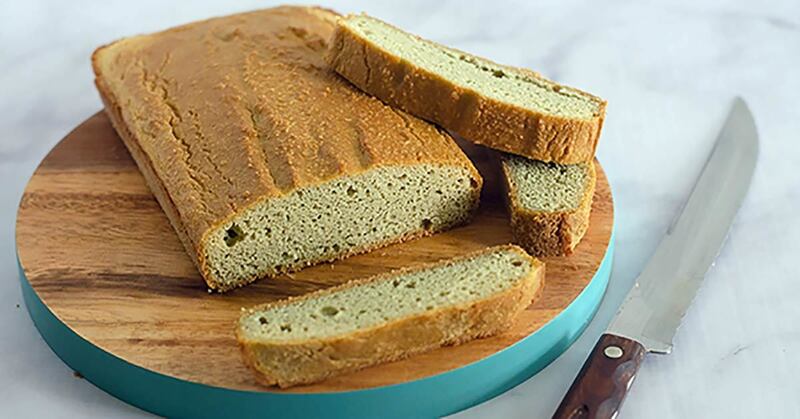 This bread is perfect for those following a gluten and grain-free, keto, low-carb, paleo or dairy-free diet. It tastes like the traditional bread but it’s buttery, fluffy, and versatile, with a crusty outside and soft inside. This Macadamia Nut Bread is the closest thing you can get to traditional loaf. The recipe in this article is inspired by the woman in “The Magic Pill” documentary who baked bread out of ground macadamia nuts. Although it’s changed drastically, the base are ground macadamia nuts. All you have to do is grind them up using a food processor until you get a butter consistency. You can also use a blender, but you’ll have to add some liquid to blend well. Add the eggs one at a time and blend until mixed well. Then, add the baking soda, coconut flour, and apple cider vinegar and mix. Add the dough in a greased loaf pan and bake for 30 to 40 minutes. The bread should get a nice and crispy outer layer. Let it cool before slicing. You can store it in the fridge for up to a week, or at room temperature for three to four days. This delicious Macadamia Nut Bread goes well with peanut butter or jam at breakfast, or with some butter at dinner. Here’s how to make it and bake it. Add the nuts in a food processor or blender and pulse until you get butter consistency. You can add one egg at a time if you use a blender. Scrape down sides of the food processor or blender and add the rest of the eggs. Pulse until well-combined. Then, add the baking soda, coconut flour, and apple cider vinegar and blend well. Place the batter in a greased loaf pan and smooth its surface. Put the pan on the bottom rack and bake for 30 to 40 minutes. The bread should get a golden brown top when it’s baked. Let the bread cool at room temperature for 15 minutes before removing it from the pan. Slice and serve. You can use the Macadamia Nut Bread for three to four days as long as it’s stored in an air-tight container at room temperature. If you keep it in the fridge, it’ll last for a week. One slice contains 3 grams fiber, 4 grams total carbs, 5 grams protein, 14 grams fat, and 151 calories.